As the last golden rays of the setting sun disappeared below the horizon at this the most westerly point of the British mainland, I sit and reflect on my latest short and very enjoyable cycle tour. Pauline’s medical condition having forced a change of this years plans, left me free to cycle around the country, visiting places she had never shown any inclination to visit. During a tour of East Anglia, on my way to the Mildenhall Rally I had called in at Lowestoft. A wrong turn and an urge to get a closer look at a huge wind turbine on the docks, led me to a plaque on the dockside proclaiming the most easterly point of Britain. 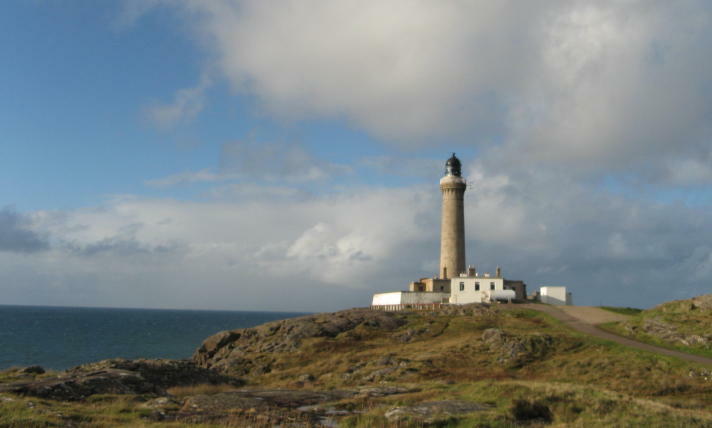 The directional marker on the plaque showed a straight line mileage of 451 to Ardnamuchan Point, the most westerly point of the British mainland. That was one of the places I had intended to visit, “one day”. 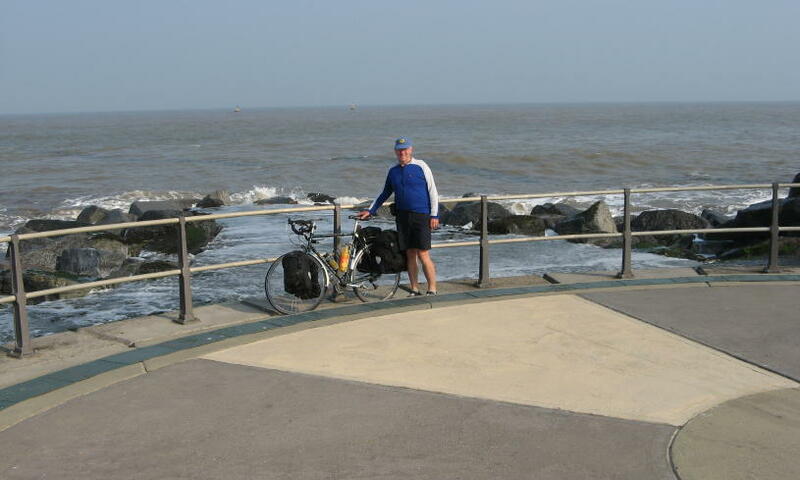 It was then I decided to revisit Lowestoft after the Fell Club AGM and cycle from East to West. So it was that I found myself back in the same place ready to commence the ride. My route planning was very flexible being guided mainly by a few key places I wanted to visit and areas I wished to cycle through. As for all my tours I had marked on maps (pages torn from a road atlas) possible campsites taken from various lists. From the start I wanted to camp on sites I had never previously used so I could add new ones to the FC list. Also whenever possible I camped at sites that had showers and toilets. Although I have nothing against survivalist camping, my philosophy is for civilised cycle camping and only when needs must do I rough or wild camp. The first four days consisted of mainly flat roads as I rode through the lanes of Suffolk, Norfolk, Linconshire and into Yorkshire. Headwinds were my own cycling problem, the traffic only posing a problem when having to use short sections of major roads or cross them. Twice locals pointed me in the direction of campsites that were not marked on my map and each of them proved to be a good choice. One in particular at near Goole at Whitgift proved to be a blessing in disguise as I had battled 65 miles from Woodhall Spa against the annoying wind. On arrival I must have looked a sorry sight because the owner refused payment for the night and insisted I camp out of the wind between two unoccupied caravans. Once past Tadcaster the terrain changed to one of undulating hills and the ride became much more interesting. That day ended at the C&CC site at Boroughbridge. I stayed near the town because I had developed a craving for a Chinese takeaway. It turned out to be a very disappointing meal. My route from there took in the lovely places of Ripon, Richmond and Winston. Then over the moors to Tow Law. Here I was entertained by three charming local ladies in a café, they insisted on buying me coffee and a sausage quiche. From there my route was via Corbridge and Bellingham, where I stayed at a great little farm camp. It boasted showers, a well kept camping area and was very close to the village centre with shops and pubs. 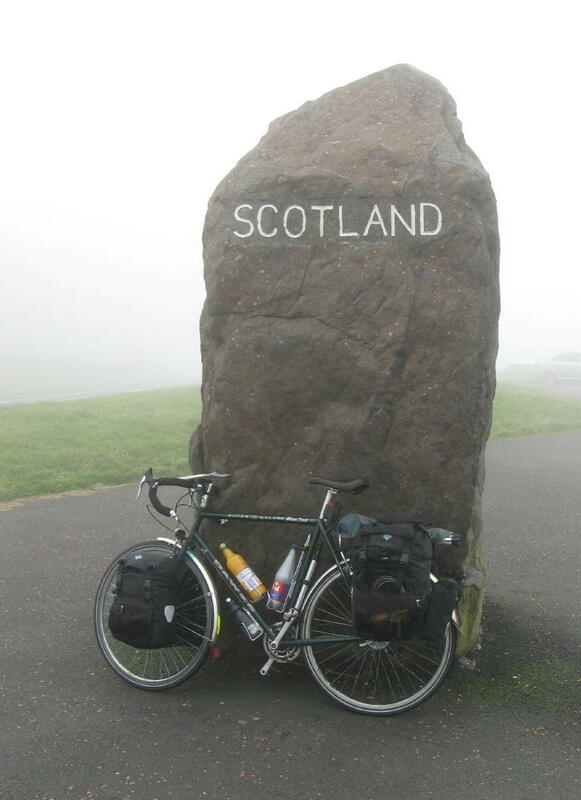 Crossing the border to Scotland was my next objective, this I did at mist shrouded Carters Bar. Losing the mist on the descent I got to Jedburgh in beautiful sunshine, in time to have lunch by the river. Lauder was my stop for that night. Getting to the C&CC site I found it managed by a couple I knew. After Lauder the weather which up to now had been dry turned to rain. It lashed down as I made the climb over the Moorfoot Hills and into Edinburgh. With the rain looking set for the rest of the day, I decided to end early at the Caravan Club site on Marine Drive. It was the most expensive site of the trip and its saving grace was good clothes drying facilities plus a covered cooking and dining area for tent campers. As the bus into the city centre stopped at the gate, I took the opportunity to spend the rest of the day meandering around the sites of the capital. 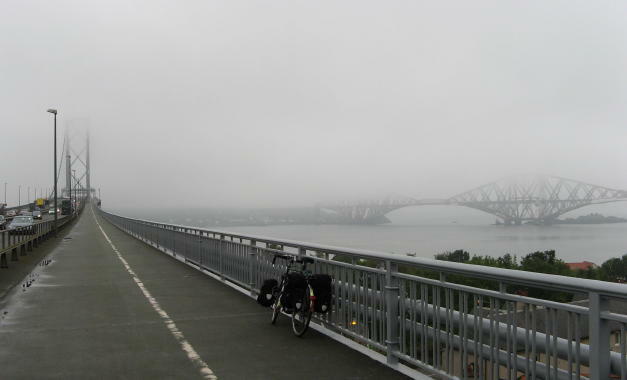 A sea fog hung over the Firth of Forth when I left the site and made my way towards the Forth Bridge. Following the free Sustrans map of the area I was soon in trouble. A huge flight of steps on the cyclepath barred my way. With directions from a local I managed to navigated around the obstacle and get to the bridge. Shrouded in mist the famous railway bridge was hardly visible from the road bridge. The cycleway is clearly marked to get on the bridge, however when getting off the signs dry up and no road corresponds with the Sustrans map. Stopping at a bike shop to purchase a new cycle computer, the owner directed me onto a nice route along the river to Alloa. The Sustrans map was duly deposited in a waste bin. Lunch was taken in the shadow of the famous Wallace Memorial on the outskirts of Stirling. My route then took me through the Trossachs, where the scenery underwent a dramatic change. Hills and lochs dominated the landscape as roads climbed and descended through beautiful glens. Following tourist information advice I arrived at one campsite to find it closed due to electrical problems caused by flooding. The site owner could not understand why I had been sent there as the information centre was well aware of the problem. Directed five miles further on to a site at Balquhidder, I arrived to find an it almost deserted. A site worker said there were not officially open for tents but if I found a suitable spot I could camp. The facilities were open for the one occupied caravan on the site and again no charge was made, even the showers were free. Next day was my favourite of the trip, it was not the first time I’d cycled this route and hopefully not the last. The road passed through Glen Dochart to Crainlarich, then to Glencoe via Tyndrum, Bridge of Orchy and Rannoch Moor. Gliding along from one glen to the next with easy graded climbs and gentle descents, stopping often to admire the spectacular views of majestic mountains and rough open moorland. What more could one want from a days cycling? At Glencoe I camped at the best kept and most beautiful located site of the tour. 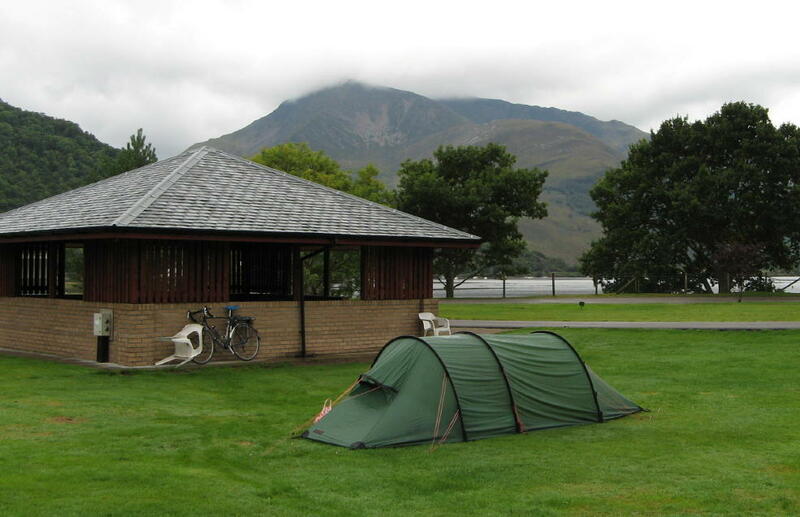 On the shore of Loch Leven, it boasted immaculate facilities, very friendly staff, an undercover camper’s kitchen and dinning area, which became a real bonus. In fact the site was so nice I decided to stay two nights and have a day off to visit Fort William. The second afternoon the wind started to build and eventually got up to force 8 and with torrential rain. That evening I cooked and ate under the cover and was even asked if I wished to re-pitch my tent under there. I declined but next morning I moved all my gear inside to make packing up easier and drier. The rain eased and wind abated to about 30 mph before I left the camp just before 9.00am. By the time I reached the Corran Ferry the rain had ceased completely and I was able to take off my waterproofs. Once across Loch Linnhe the traffic became minimal and my only problem was the undulating roads and leg sapping climbs made worse by the still 30 mph headwind. It was a tough day but the journey alongside lochs and over the mountains of the peninsular was awe-inspiring. At 4.50 pm I reached the lighthouse. The visitors centre was about to close so I asked if I could camp somewhere near. Davie the manager said; “anywhere you like but take my advice and find a sheltered spot, the wind will get up again tonight”. So here I am at the end of another journey. Sitting on this exposed promontory, gazing at the sun setting over the Atlantic and distant Hebrides and listening to seals barking in the sea below. Dining on my camp cooked evening meal, a feeling of contentment engulfs me. I contemplate the wonders of nature in this remote place and the lovely thought that I am the only living person within two miles of here. Tomorrow I will start a steady meander towards home via Mull and Oban but for now I am savouring this lovely evening. Lowestoft Ness to Bungay via Beccles. 22 miles Camped at Outney Manor on the Bungay bypass. Bungay to North Runcton via Wymondham, Watton, and Swaffham. 58 miles Camped at King’s Lynn Camping just off A47 at North Runcton 4 miles from King’s Lynn. North Runcton to Woodhal Spa via King’s Lynn, Holbeach and Conningsby. 59 miles Camped at C&CC site at Woodhall Spa. Woodhall Spa to Whitgift via Bucknall, Kirton in Lydsey and Amcotts. 65 miles Camped at Whitgift Hall Caravan & Camping Whitgift. Whitgift to Boroughbridge via Goole, Selby, and Tadcaster. 54 miles Camped at C&CC site at Boroughbridge. Boroughbridge to Winston via Ripon, and Richmond. 46 miles Camped at Winston Caravan Site in village centre. Winston to Bellingham via Tow Law, and Corbridge. 63 miles Camped at Demesne Farm near the centre of Bellingham. Bellingham to Lauder via Carters Bar and Jedburgh. 61 miles Camped at C&CC Lauder site. Lauder to Edinburgh 29 miles Camped at Caravan Club site on Marine Drive. Edinburgh to Balqhidder via Alloa, Bridge of Allan, and Callander. 67 miles Camped at Balquhidder Braes site at Balquhidder Station. Glencoe to Ardnamurchan Point via Corran Ferry, Strontian and Kilchoan. 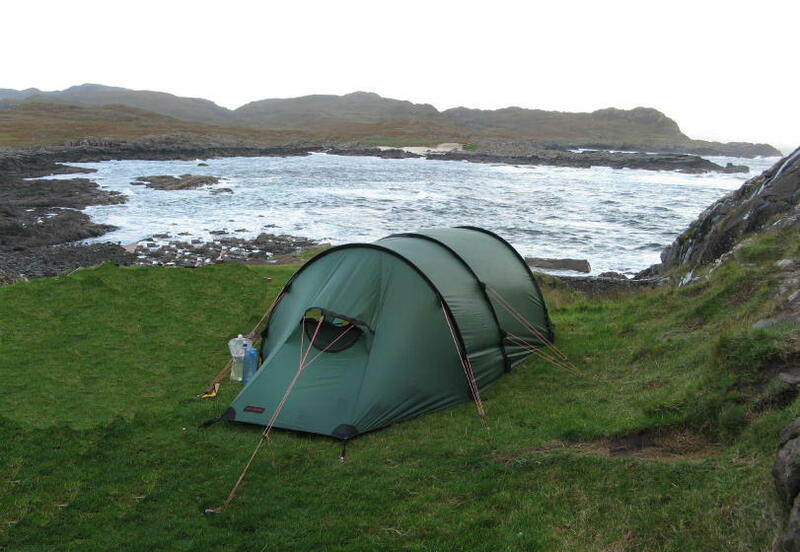 59 miles Camped at Ardnamurchan Lighthouse wild camp by visitor centre on sheltered side of lighthouse. Full details of the campsites will be added to the Fell Club list.